Get your Greek on for game day! 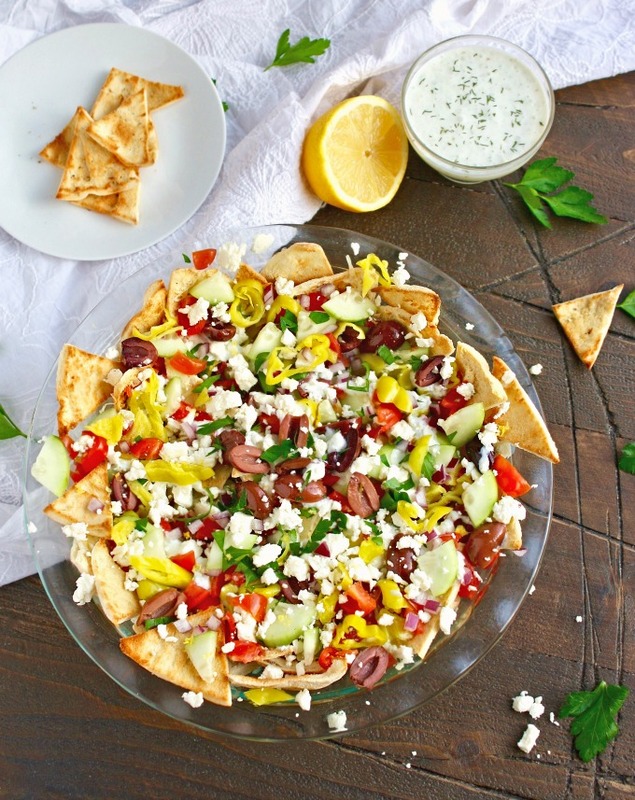 Nachos are always a hit at get togethers, and these Greek Nachos with Tzatziki Sauce are no exception. You’ll love this fresh-flavored twist on a favorite snack. Will your team be in the game this weekend? Not mine, as usual. BUT I’ll definitely focus on the food that surrounds the game. Whether you’re totally into the game or you’re simply looking forward to a relaxing Sunday, you gotta eat! 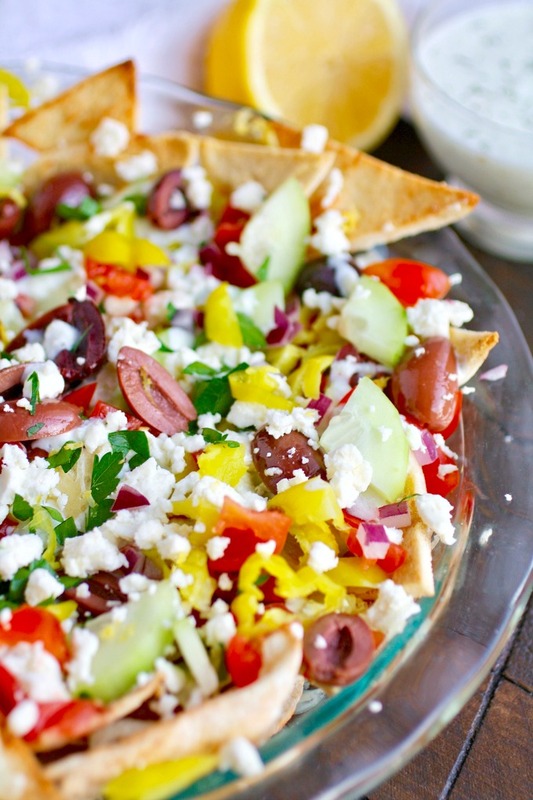 I suggest making a batch of these Greek Nachos with Tzatziki Sauce to dig into. If you’re having friends over, grab-and-go snacks work wonders. Besides, who doesn’t love food that you can scoop up, pile on your plate, and take with you to your spot in the room? 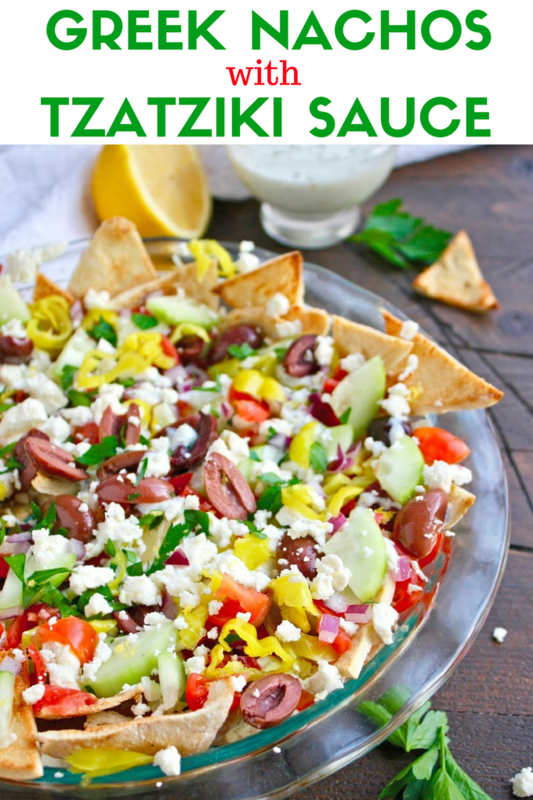 Greek Nachos with Tzatziki Sauce make a flavorful snack to enjoy any night of the week, whether you’ve got football fever or not! You'll love the flavors you'll find in these nachos! These are perfect for snacking! heat the oven to 350 degrees F. Place the cut pita bread triangles on two baking sheets in a single layer. 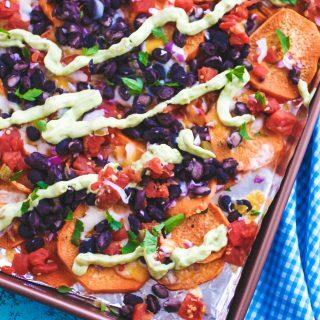 Customize these nachos with your favorite ingredients, more or less to suit your tastes! These look perfect for Game Day! Gosh, these look amazing!! I need to make them asap! Thanks, Kassandra! Hope you love them! That's awesome, Liz! I think you'll love this snack! Thank you! 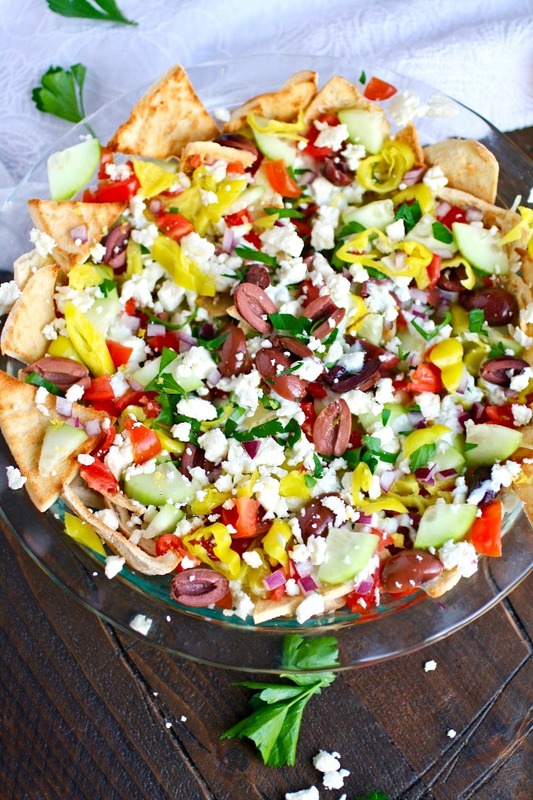 Love this twist on nachos! Fusion at its finest. Perfetc healthy snack for Superbowl Sunday! Thanks for the idea. Thanks, Jessica! Hope you try them! I love nachos! We have it usually when we're too lazy to cook an actual meal. Never though of having them with tzatziki sauce. I usually like them with guacamole. Hi Cristina! I love them for a "lazy day" meal, too! Hope you enjoy these! 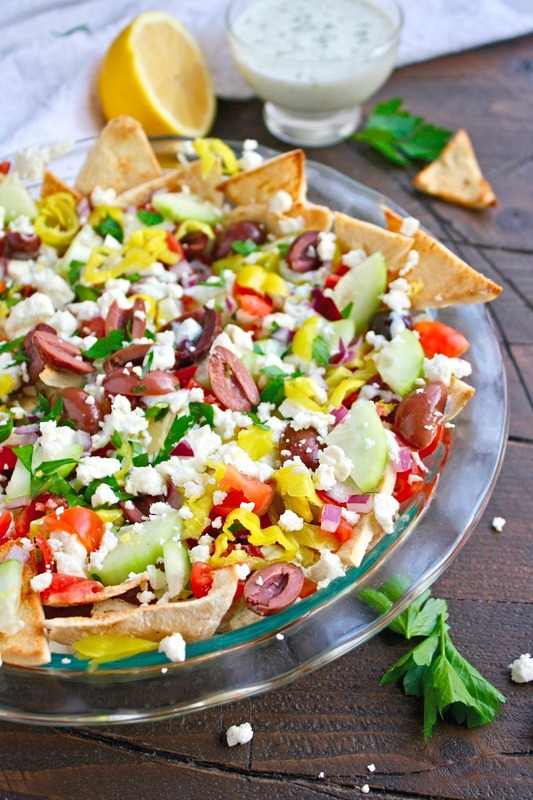 I love Greek Nachos and these are SO pretty! Such a great super bowl snack idea! Thanks, Des! Hope you try them soon! Nachos are one of my favorite game day snacks! This Greek version sounds amazing! Thanks, Michelle! Perfect for any sort of fun! These are all my favorite flavors! Love that you turned them into nachos. Thanks so much, Jenny! It's a great snack! Love this take on nachos - they look amazing! I am so excited about these! I love greek salads and gyros and pretty much all Greek foods! These look so fresh and delicious! Thanks, Jennifer! Hope you try this! These look fantastic....I LOVE Greek flavors! Thanks, Cathy! It a fun twist! Thanks, Annie! I really love all the fresh flavors in this! I would love to try these! Tzatziki sauce is always so fresh! I just found this recipe- must try! Wish I would have had it last weekend! Aw, darn! It's a good one - I love all those flavors together! Thanks!